Whitechapel Central is set to transform a former Safestore facility into a new urban quarter, with 30% of the site dedicated to new public realm. 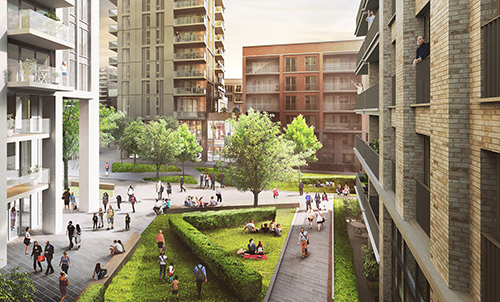 The scheme of 564 new homes – many being family-sized – alongside around 38,000 sq ft of commercial area, including flexible office space, shops, a gym and a café, plus storage facilities for the local market, is fundamental to Whitechapel’s vision for regeneration. Straddling two nearby conservation areas, the design focuses on connectivity, with new pedestrianised streets and squares, and a number of ‘character areas’. The predominantly brick and reconstituted stone design creates strong, street-based frontages, while a central glass and aluminium-clad tower enhances the future townscape of Whitechapel.